An in-depth comparison of Fuji’s “pro quality” FUJINON XF 16-55mm f/2.8 WR, the original FUJINON XF 18-55mm f/2.8-4 R OIS kit lens, and the FUJINON XF 18-135mm f/3.5-5.6 OIS WR jack of all trades. XF 16-55mm F/2.8 WR vs. XF 18-55mm F/2.8-4 vs. XF 18-135mm F/3.5-5.6 WR, a comparison of Fuji’s zooms. The pro standard zoom has long been a staple in almost every photographer’s bag. They’re meant to be workhorses that can take anything we throw at them. Low light, inclement weather, fast-moving subjects, you name it. After a long wait, Fuji’s standard f/2.8 zoom is available, which, along with the XF 50-140mm f/2.8 WR fills the two biggest gaps in their lens lineup. We could achieve these focal lengths before, but never with a constant aperture, and outside of 18mm, never at a maximum aperture of f/2.8. This piece will explore in-depth what you get for your extra money, aside from more size and weight. This ad and tracker-free site is made possible by the support its readers. If you enjoy the content, you can help by using the affiliate links below. Thanks! Make no mistake, the XF 16-55mm F/2.8 WR feels as pro compared to the other two lenses in this comparison as any DSLR standard zoom does when stacked up against the kit lens. The XF 16-55mm F/2.8 WR feels solid, like a tank. The XF 18-55mm F/2.8-4 OIS has excellent build quality, but this new pro zoom makes it seem wimpy by comparison. 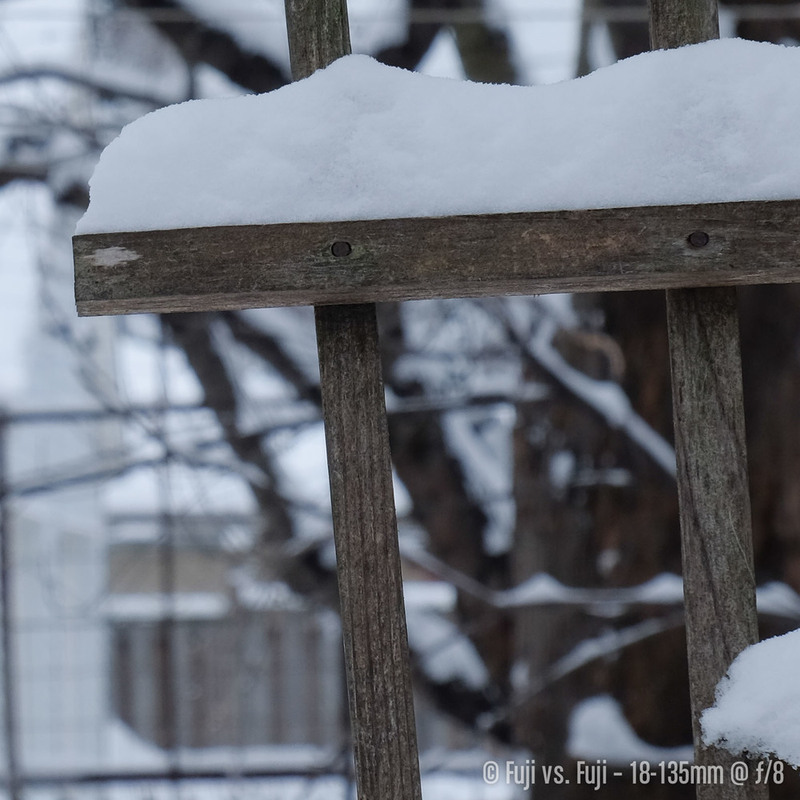 The XF 18-135mm F/3.5-5.6 WR is a little closer in size, but definitely not substance. Just look at the weight difference. There is all kinds of glass in that red badge zoom. The aperture ring of the new zoom is a little more solid than the other two. Not XF 50-140mm F/2.8 WR solid, but definitely more rugged feeling. With the holding technique described below, I can actually turn the aperture ring with just one finger on either of the consumer zooms. With the XF 16-55mm F/2.8 WR, I need my thumb to turn it comfortably. The zoom ring is also has a little bit more weight to it on the 16-55mm. It’s not as outstanding as the XF 50-140mm F/2.8 WR thanks to it’s telescoping front element, but especially compared to the XF 18-135mm F/3.5-5.6 WR, much more robust. My favourite zoom rin of three though, is the orginal XF 18-55mm F/2.8-4 OIS. The metal is more grippy, it turns nice and smooth, and I can zoom through its entire range with a single turn. There’s not a whole to write about on the focus ring front. The 16-55mm’s feels a bit more consistent in its turning smoothness. The 18-135mm is where the biggest difference is. That missing chrome band between the zoom and focus rings seems to give the focus ring a tiny bit of play, and less smooth rotation. It’s not even close to anything that would affect day to day use. As for switches, well, the 16-55mm doesn’t have any. A marked aperture ring and lack of OIS leaves little need for any switches, so there really isn’t much to compare. The 18-55mm f/2.8-4 and 18-135mm f/3.5-5.6 are pretty much identical when it comes to switches, which is to be expected. Let’s get this out of the way quick since it’s hardly new news. The 16-55mm f/2.8 is big. It’s also heavy. The small size and light weight of X-Series cameras can be a double-edged sword when it comes to beefier lenses like the two new pro zooms. An overall front-heavy camera is tough to avoid with a zoom; it’s impossible with the 16-55mm f/2.8. With the 18-135mm f/3.5-5.6 attached, even X-E bodies are unbalanced. The best mate for the current size and ergonomics of Fuji bodies is without question the 18-55mm f/2.8-4. One final note on size and weight, you’ll need an L-plate or a grip attached if you want your camera to sit flat with either the 16-55mm f/2.8 or 18-135mm f/3.5-5.6 attached. The 16-55mm f/2.8 isn’t a lens you’re going to want to use one-handed for long. Add a second hand to your shooting, which you should, and the 16-55mm f/2.8 handles great. I can reach and adjust all three rings on the lens, and I don’t have large hands. My wife, whose hands are even smaller, needs to adjust her handholding in order to get at all the rings. A good hand position is to place your ring finger on the aperture, your middle finger on the zoom ring, your index finger on the focus ring (as needed), and move only your thumb among the three. The rings on both the 18-55mm f/2.8-4 and 18-135mm f/3.5-5.6 are equally accessible, and shooters with larger hands may find the 18-55mm f/2.8-4 a bit cramped. Believe or not, the 16-55mm f/2.8 is not shortest when at 16mm. Zoom in to around 19mm and you can see the lens barrel go in ever so slightly. This is more than just half interesting trivia; the lens barely moves between 16 and 23mm, resulting in less overall protrusion, which is nice. This is not unlike Nikon’s 24-70mm standard zoom, except Fuji’s doesn’t stick out as much on the wide end. Both the 18-55mm f/2.8-4 and 18-135mm f/3.5-5.6 are at their shortest at 18mm, and they just get longer from there. This isn’t much of a problem with the little 18-55mm, but the 18-135mm gets real long, real fast. Another area the 18-55mm f/2.8-4 wins in is eye-blow. If there is any, I can’t feel it. With the other two lenses, you might dry your eye out if you zoom out too quickly. The 18-135mm f/3.5-5.6 is the worst here. It’s a pretty level playing field when it comes to hoods. All three lenses feature fairly large plastic scalloped hoods. The eldest zoom is missing the ridged interior which ought to keep more stray light away from the front elements, The 16-55mm’s hood has one extra ridge to the shape of the exterior that makes it even wider relative to the lens than the other two. To give you a sense of scale, the three hoods can be nested within each other as seen below. Fuji’s new Red Badge lenses ship with a new style of lens cap. These are a vast improvement over the previous style of cap, and I don’t feel the need to replace these ones. Given the price disparity—not to mention the size and weight disparity—one would assume Fuji’s newest zoom would blow the humble kit zoom out of the water. It’s a fair assumption, but a tall order considering how pleased I’ve been with the images I’ve been able to get out of the 18-55mm. The same can be said for the 18-135mm. 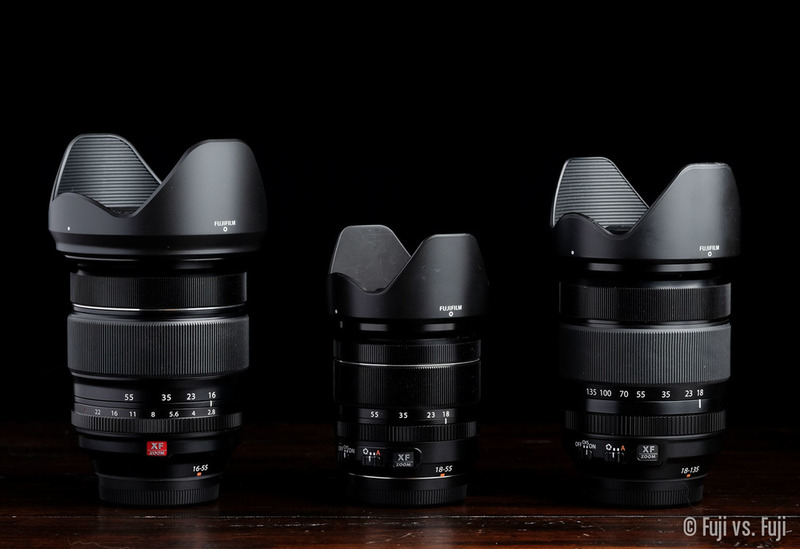 It’s range is unmatched in Fuji’s lineup, but can the same be said for optical quality? Let’s find out. NOTE: I make every effort to ensure focal lengths are the same between tests, however the 18-135mm ended up clocking in at 49.4mm despite the zoom being explicitly set to the 55mm mark on the barrel. This is one area where Fuji needs to improve. Zooms have inconsistent readouts for the focal length. It’s entirely possible to capture two images with visibly different fields of view that have the same extremely specific focal length (like 49.4mm) in the EXIF data. It also depends on which way the barrel markings are approached. Zooming in and zooming out results in slightly different fields of views at the same marking. Not good. I take some responsibility here for not having “checked my work,” but with something like focal length that’s clearly marked on the barrel of the lens, I really shouldn’t have to. I don’t check to make sure the aperture I selected was actually used either. Let’s take a quick look at what sort of range we can expect out of each lens, starting at the wide end. I’ve seen it written that the difference between 16mm and 18mm on APC isn’t that much. Call me crazy, but I’d say it’s significant enough in these zooms that it should absolutely factor into your purchasing decisions. If you’re looking for one lens to do it all vs. supplementing with a wide prime, and you’re not concerned with reach, the 16-55mm f/2.8 will definitely get you wider. Strangely, the 18-135mm f/3.5-5.6 appears to get us a hair wider than the 18-55mm f/2.8-4 does. Things appear to be consistent between the pro and kit lens, save for the framing which should be consistent. My tripod didn’t move and I lined up the marking on my L-plate as usual. This isn’t the first time I’ve seen discrepancies in framing between Fuji lenses that should be identical though. The 18-135mm f/3.5-5.6 shows what might be it’s only real advantage in this comparison. If you want to go from wide to tight with a single lens, this is your only option. With a maximum aperture that’s ½ a stop faster at the wide and, and up to 2 ½ stops faster by the time 55mm is reached, superior background separation with the 16-55mm is a given. Here’s how things stack up. For this comparison, I focused on a trellis with a busy background. At maximum aperture, the difference is huge. The full stop advantage of the 16-55mm f/2.8 embarrasses the other two lenses. Between the kit zoom and the 18-135mm, it’s a fairer fight. The extra ⅓+ advantage of the 18-55mm helps it pull ahead a little, but the bokeh on the 18-135mm simply isn’t a pleasing to my eye. Things get a little more interesting as the aperture gets closer. Of note, by 50-55mm the 18-135mm’s variable aperture has already stopped itself down to f/4.7. This lens is not swift. Aperture difference aside, the 18-135mm f/3.5-5.6 still has the least pleasing bokeh. Comparing the kit and pro zooms, the pro zoom appears to blur background detail out a little more, but quality of the blur appears to be a little better on the 18-55mm f/2.8-4. Impressive showing from the kit lens. Sadly, both the 18-55mm f/2.8-4 and 18-135mm f/3.5-5.6 missed focus at f/5.6, so I’m unable to compare crops here, so we’ll move on to f/8. With even apertures, it’s pretty much a toss up between pro and kit zoom seems. The 18-135mm brings up the rear again, but the difference isn’t as great. The next set of crops will show detail of the trellis as well. Nothing new to say on the bokeh side of things here, but the pro zoom appears to be slightly sharper than the kit zoom wide open. Both lenses are significantly sharper than the super zoom, which is quite soft at its maximum aperture of just f/4.7. With the pro and kits zooms on equal ground, the sharpness advantage of the pro zoom becomes ever so slightly greater. In this crop I can still notice the increased blurring of the 16-55mm f/2.8, but the quality is a wash. No change with the 18-135mm f/3.5-5.6 here. Same soft image with poor bokeh. By f/8, the 18-135mm finally catches up to the 18-55mm. The 16-55mm is still sharper than both, and has more pleasing bokeh, but neither are by a wide margin. Falloff is something I’m least concerned about. Partially because more it’s often something I end up adding to some degree in post, but mostly because it’s pretty easy to correct provided it isn’t too extreme. Here we have our snowy image with the exposure neutralized and shadows heavily exaggerated to get a sense of how much falloff we’d be dealing with. In short, I’m not concerned about vignetting with any of these lenses, but the 18-55mm f/2.8-4 performs the best, and the 18-135mm f/3.5-5.6 performs the poorest. If you’d like to purchase one of these lenses, or anything else for that matter, please consider using one of the Amazon affiliate links below. The price is the same for you, but a small percentage of the purchase price goes to me, which really helps keep this site going. Thank you!